Calling all art and garden lovers! 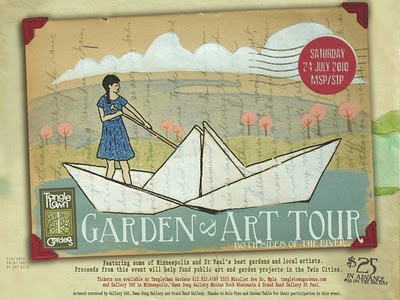 Don’t miss Tangletown Gardens’ 2010 Garden and Art Tour, Saturday July 24th, 9:00-4:00, and evening reception. This year’s tour features nature and garden-themed works by dozens of the region’s finest contemporary artists, installed in some of best private gardens in the Twin Cities. Expect the un-expected, enjoy complementary refreshments and wine tasting throughout the day, on this self guided tour of natural and creative beauty. All proceeds support public garden and art projects throughout the Twin Cities.